Bring the popular Paw Patrol pup Marshall to life with Zoomer Marshall. 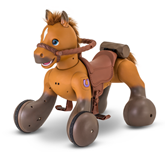 Making the technology from its robotic dog Zoomer more preschool-friendly, Spin Master's robotic Marshall features more than 150 Paw Patrol sounds and phrases, and more than 80 interactive missions and tricks. There are several ways to play and interact with Zoomer Marshall. When you first turn on the toy, Marshall will be in Pup mode. In this mode, push down on Marshall's head to activate phrases and sounds. You can also tickle Marshall's chest sensors to make Marshall laugh or wave your hand in front of the chest sensors to make Marshall follow you. If you open Marshall's pup pack, you'll hear more phrases and be able to launch the water cannon projectiles. But press Marshall's badge button to enter Mission mode. In this mode, Marshall will guide kids on several interactive rescue missions, such as finding his animal friends, using the water cannons to put out fires, and helping Marshall get a high score in Pup Pup Boogie. Just follow Marshall's instructions (such as opening his pup pack or pushing down on his head) to help complete the missions. Zoomer Marshall comes with two water cannon missiles and an instruction booklet. 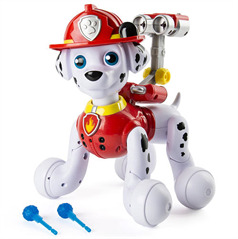 Kids will like all the different things they can make Zoomer Marshall do, as well as feeling like they're part of the Paw Patrol team as they help Marshall complete missions. With so many real Paw Patrol phrases and sounds, this really brings the character and world of Adventure Bay to life for kids. Paw Patrol Zoomer Marshall is for Paw Patrol fans ages 3 and up. Four AA batteries are required but not included. The toy has two volume levels. Paw Patrol! Paw Patrol! Is your nephew or niece on Paw Patrol? If so, the Paw Patrol Zoomer Marshall from Spin Master is bound to be their new favorite little buddy!